Transport Research Laboratory, Bracknell, England, 2013. This entry was posted in WitneyBUG and tagged bikes, dutch, english, infrastructure, london, roadsafety, witney, words on Wed 1 May 2013 by kevin hickman. I saw this and didn’t understand if the cars were going to stop for the cyclists like in Germany where I was always nervous that one of them might be a British driver :0) It’d be good if cyclists had the priority here. 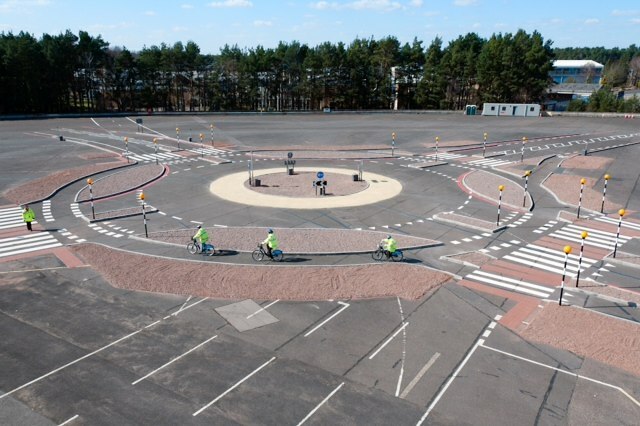 In the picture of that trial mock-up of a dutch roundabout bikes have priority over motor vehicles and pedestrians have priority over both. The ‘shark’s teeth’ (white triangular markings) determine who gives way. Andrew Gilligan makes the point in the video that it’s not immediately clear what’s what, but even so it’s safer than a current uk roundabout.